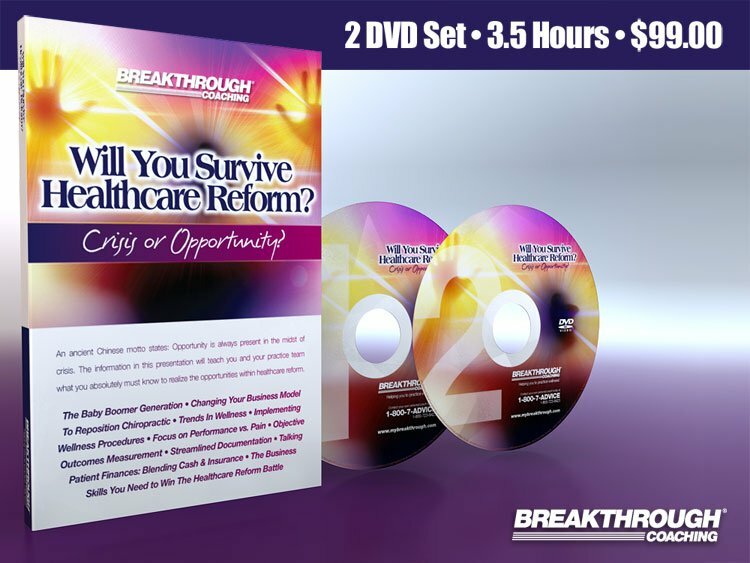 Will You Survive Healthcare Reform: Crisis or Opportunity? The information most vital to your success in the era of healthcare reform… collected in one place and broken down into easy-to-apply action steps that will enable you to transform your practice and meet the rapid-paced demands of the new healthcare marketplace. Filmed in front of a live audience at Parker College of Chiropractic, this proven system will bring you astonishing opportunities and extraordinary results, and pave the way for success, wealth and abundance. 7 fully customizable color Power Point presentations, black and white patient handouts, wellness seminar series implementation checklist, customizable promotional Flyer. Seminars include: How to Implement a Wellness Seminar Series, 9 Steps to the Best Sleep Ever, Better Eating for Better Aging, Weight Loss: The Doctor's Solution, Exercise the Right Way, Relaxing Your Body & Mind, and Wellness Orientation. This comprehensive training video has been carefully developed as a tool to help instruct clinical staff in fundamental rehabilitation procedures. This program begins with a step-by-step demonstration of Movement Pattern Analysis, followed by instruction in the Post-Isometric Relaxation, and ends with a six-step, progressive spinal stabilization protocol through Neuromuscular Re-education. The DVD also includes two bonus exercises: Range of Motion and Isometric Exercises for the neck.